You help move Purdue and the world forward every day. You're making a difference for our students. Explore the many resources available to you. Purdue Farmers Market to return May 2 The Purdue Farmers Market will return at the north end of Memorial Mall along Oval Drive on Thursday (May 2) for the start of its 10th season. Recap of April 15 Senate meeting Despite support from more than 60 percent of its members, the University Senate voted down on Monday (April 15) a proposal that would have assigned a special committee to explore creating a civics-based graduation requirement for undergraduate students. It's fortunate for Purdue students that Paul Ryder's early career plans took off in an unexpected direction and included a layover in Krannert's Executive MBA program. 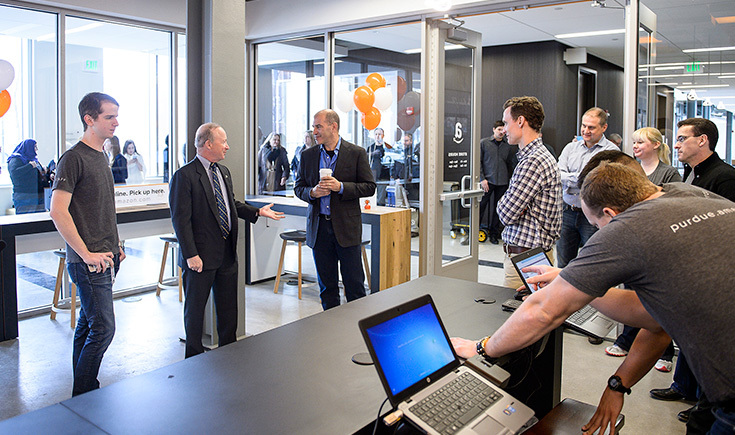 As vice president for Amazon, Ryder helped the company land on campus with Amazon@Purdue. That's the company's first-ever staffed order and drop-off location. It's designed to save students money. But Ryder also offers students something just as valuable — the perspective of an engineer whose career path transitioned into business and a position running the consumer electronics division of Amazon. "I thought I had died and gone to heaven," he says.